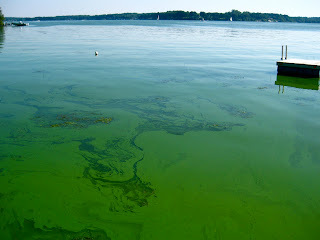 Ithaca, NY -- In August 2010, Sodus Bay, Lake Ontario, suffered from algal bloom (Microcystis sp.). Now, with New York Sea Grant (NYSG) funding, a team led by Dr. Gregory Boyer, from the SUNY College of Environmental Science and Forestry in Syracuse, and Joseph Atkinson form the University of Buffalo, is developing a model to provide better understanding of the nutrient and algal dynamics of Sodus Bay. Boyer is a recognized leader in algal blooms research, having worked on red tides along the Atlantic Coast and more recently focusing his efforts on the blue-green algae blooms that occur in the Great Lakes. Boyer has developed an analytical technique for measuring microcystin and other toxins produced by blue-green algae. Water quality managers are among the stakeholders impacted by Boyer’s research. The results of the research work on Sodus Bay will aid decision making by the Bay’s natural resource managers and marina operators. “New York Sea Grant projects address the critical needs of coastal stakeholders. Dr. Boyer and his team are focused on applying their academic expertise to better understand and control harmful algal blooms. What we learn from this project on Sodus Bay should lead to valuable information for use by shoreline communities throughout the Great Lakes region,” said NYSG Extension Director Dr. Katherine Bunting-Howarth, Ithaca, NY. The Sodus Bay project has received $192,381 in Sea Grant funding. Monies for these projects come via NYSG’s parent organization, the National Oceanic and Atmospheric Administration (NOAA) National Sea Grant College Program (NSGCP), Silver Spring, MD. The Sodus Bay project funds are among the $2.4 million New York Sea Grant has received for projects in 2012-2013. In addition to addressing important problems and opportunities, NYSG's 2010-2013 Omnibus funds will support NYSG research, extension and education efforts on important coastal issues related to storm surges and flooding, seafood safety, wetland habitats, fisheries, and harmful algal blooms, among others. The funds will also provide graduate students with financial support through the Sea Grant Scholar Program, and sponsors conferences, seminars and workshops on a variety of coastal issues each year. · Algal blooms occur in both freshwater and marine environments. · Algal blooms may appear as discolored water, often green, but also yellow-brown or red, depending on the species of algae. Large clumps of algal bloom may wash up on shore. · Algal blooms can be harmful to the aquatic environment. As algae decays it consumes dissolved oxygen. Lowered levels of dissolved oxygen can cause aquatic plant and animal die-off. · Algal blooms may also impact the quality of public drinking water sources. 0 Comments to "NY Sea Grant funds Lake Ontario algal bloom research on Sodus Bay"